19 Sep, Coimbatore:In a strategy meeting held in Coimbatore today, farmers leaders from the South Indian Coordination Committee of Farmers Movements (SICCFM)  have rejected the RCEP Trade Agreement, a mega trade deal between some of Asia’s biggest economies, because of disastrous impacts on India’s farmers livelihoods, who are already reeling under an agrarian crisis and low incomes. They announced plans to agitate nationally in collaboration with other farmers alliances. Two major farmers protests are planned in New Delhi on 2 October , and 30 November  and RCEP will be high on the agenda. The Regional Comprehensive Economic Partnership (RCEP) is a a free trade partnership which will open India’s markets to some of the largest economies in Asia- like China, Japan. The RCEP is currently being negotiated between 16 countries- which includes ten ASEAN countries  as well as other Asia Pacific countries include Australia, China, India, Japan, South Korea and New Zealand. Although the member countries want to conclude the deal by Nov 2018, Indian government is unlikely to acquiesce because of growing resistance at home by farmers and workers. The RCEP agreement will be the largest in the world in terms of population (3.4 billion or 49 per cent of world population), with a combined GDP of around $22 trillion and a trade share of 30 per cent. India has been asked to remove import duties on 92 % of all traded commodities. While India has been resisting and asking for 80% . A key controversial point is that once reduced to zero, the RCEP will not allow India to raise duties at a later date – a provision that even the WTO did not impose. Dairy in particular is of concern to the SICCFM farmers, as over 15 crore Indian farmers, majorly women are milk producers. Australia and New Zealand want India to remove all duties on dairy in India.“We want production by the masses, not mass production. Our Indian cooperative milk system allowed hundreds of poor farmers to sell milk and earn an income. Now these big dairy companies Australia and New Zealand like Fonterra want to enter our market and displace us,”said KTGangadhar of KRRS. Indian seeds will also come under threat because of the patent laws which could criminalize seed saving by farmers and will replace local seeds with corporate own commercial seeds.Japan in particular has been pushing for this. “If a farmer’s field becomes contaminated by these corporate seeds- then we can go to jail! If we save the seeds for re-planting, they will arrest us for copy right infringement. 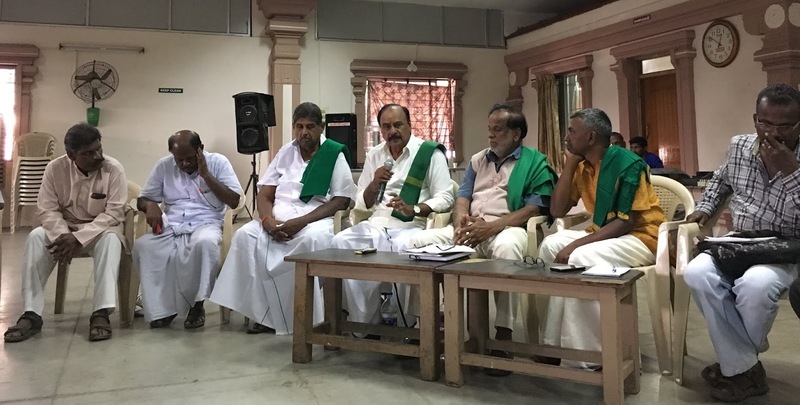 Seed is life and it belongs to all of us-we reject corporate patents on life,” said Sellamuthu of Tamil Nadu VyavasaigalSangham. SICCFM is an alliance of south Indian farmers movements like Karnataka RajyaRaitha Sangha (KRRS) of Karantaka ,TamilaVyavasaigalSangam (TVS) of Tamil Nadu, Kerala Coconut Farmers Association of Kerala, Adivasi GothraMahasabha of Kerala.